Jurgen Klopp has identified the Switzerland international as one who can bolster his attacking options, while the presence of a release clause in the 26-year-old’s contract makes a deal a financially attractive one. 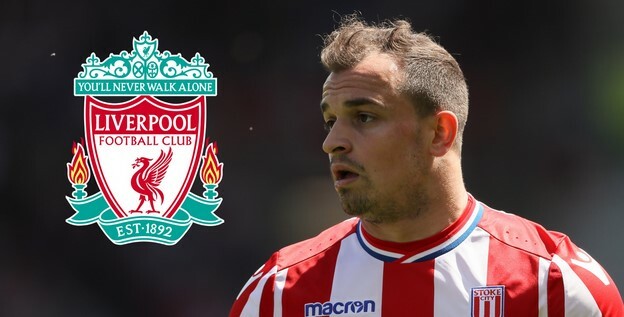 Goal understands Shaqiri will be available for around £13 million ($17m) following the Potters’ relegation from the Premier League, and that the former Bayern Munich man is keen on a move to Anfield. Shaqiri has spoken publicly of his desire to remain in England , and talks between Liverpool, Stoke and the player’s representatives are underway. Klopp has already added two players – Naby Keita and Fabinho – to his squad this summer, but is aware of the need for further reinforcements if his side are to close the gap to champions Manchester City, and remain competitive in the Champions League too. Shaqiri would not be seen as someone to come in and start games immediately, though Klopp appreciates the importance of depth across his attacking positions. Liverpool got lucky last season in that their front three – Roberto Firmino, Sadio Mane and Mo Salah – remained fit and healthy for the majority of the campaign, but their lack of depth was exposed during the Champions League final, when Salah departed injured. Shaqiri scored eight times for Stoke last season and has made 92 appearances in total since joining from Inter in 2015. He is currently on holiday after representing Switzerland at the World Cup, helping them to the last 16 where they were beaten by Sweden. Liverpool may be able to sweeten any deal by offering a player on loan. Stoke have enquired about young winger Sheyi Ojo, who scored for the Reds in their pre-season friendly win over Tranmere on Tuesday night, while Klopp must make decisions over the likes of Harry Wilson, Ryan Kent, Marko Grujic, Ben Woodburn and Dominic Solanke, among others. His side take on League Two outfit Bury on Saturday before a midweek game against Blackburn Rovers. Liverpool then fly to America for a three-game tour, where they will play Borussia Dortmund, Manchester City and Manchester United in the International Champions Cup. Shaqiri could be signed in time to play a part in that trip. Klopp, meanwhile, remains keen to add at least one more attacking midfielder to his squad this summer. Liverpool saw a deal for Lyon captain Nabil Fekir break down due to a medical issue last month, but serious alternatives are yet to emerge amid claims from the player’s agent that the move remains on the table. Fekir, in any case, is still with France at the World Cup and would not be due to return to action until early-August. Calls for Liverpool to sign a goalkeeper were intensified after Loris Karius’ mistake against Tranmere this week, but the club have made no progress with regards to a move for Alisson Becker, their preferred target. They have no interest in the likes of Nick Pope, Jasper Cillessen, Thomas Strakosha and Jiri Pavlenka, all of whom have been linked of late.